LINCOLN, Neb. – In her final home match, senior All-American Mikaela Foecke had 16 kills without an error to lead the No. 6 Nebraska volleyball team to a 25-14, 25-22, 25-18 sweep of No. 24 Missouri in a second-round NCAA Tournament match in front of a sold-out crowd of 8,382 at the Bob Devaney Sports Center. With the win, Nebraska advances to the NCAA Regional Semifinal, where the Huskers will face No. 10 Kentucky on Friday. Foecke was brilliant for Nebraska, which won its 10th straight match to improve to 26-6 on the season. She had 16 kills on 24 error-free swings, hitting a season-high .667. The senior from West Point, Iowa, moved from sixth to fourth on Nebraska’s all-time kills list on the night, passing Husker legends Jordan Larson and Nancy Metcalf (Meendering). Foecke also had a pair of aces for the second straight night and added four digs and seven blocks. Including Friday’s sweep of Hofstra, Foecke totaled 25 kills without an error in the first two rounds of the NCAA Tournament, hitting .543 while chipping in four aces, 13 digs and 10 blocks. While Foecke had a match-high 16 kills – her highest total in any of her 10 NCAA Tournament matches at the Devaney Center – sophomore Lexi Sun totaled 11 kills on a .333 attack percentage, while classmates Jazz Sweet and Lauren Stivrins had eight kills apiece, with Stivrins matching Foecke with a .667 attack percentage. Behind Foecke and Stivrins, who combined for 24 kills on 36 error-free swings, Nebraska hit .384 in the match. The total was the Huskers’ sixth-highest of the season and top mark against a ranked opponent, as Nebraska hit over .350 for the fifth straight match. Freshman Nicklin Hames set the efficient and balanced Husker attack, nearly missing a double-double with 37 assists and nine digs. Senior Kenzie Maloney paced the Husker defense with 12 digs, while Stivrins had a match-high six blocks. Nebraska out-hit Missouri by .168, as the Tigers were limited to a .216 attack percentage one night after hitting a season-best .412 against Arizona. Leketor Member-Meneh and Kylie Deberg both finished in double-figure kills with 11 and 10 kills, respectively. Riley Sents had a match-high 16 digs, but the Huskers out-dug the Tigers 41-38 and out-blocked Missouri 8-4. With the loss, Missouri finished its season with a 24-8 record. Set 1: After falling behind 3-0, Nebraska rattled off four straight points, keyed by a Sun kill and ace, and a Foecke kill. The run became 8-1 after Foecke and Stivrins stuffed a Mizzou attack, and Stivrins terminated a kill to make it 8-4. Stivrins added another kill before a Megan Miller ace, and Hames posted blocks on back-to-back plays to put NU up 12-5. A kill by Sweet made the lead eight at 16-8, and Foecke put the Huskers up by nine, 19-10, with her fourth kill. A pair of Missouri attacking errors increased the Husker lead to 23-13, and NU closed it out with a kill by Sun and ace by Hames for the 25-14 win. The Huskers hit .333 and held Missouri to .061. Foecke had five kills on six swings, and the Huskers had four blocks and three aces. Set 2: The beginning of the second set played out almost exactly as set one did. Missouri took a 3-0 lead before the Huskers went on an 8-1 run to take an 8-4 lead, and Missouri called timeout. Foecke had three kills, while Sun, Stivrins and Sweet all added one. Stivrins and Foecke also combined for a block for the Big Red. Missouri responded better this time around, however, coming back to tie the score at 10-10 with a solo block and back-to-back kills by Deberg. 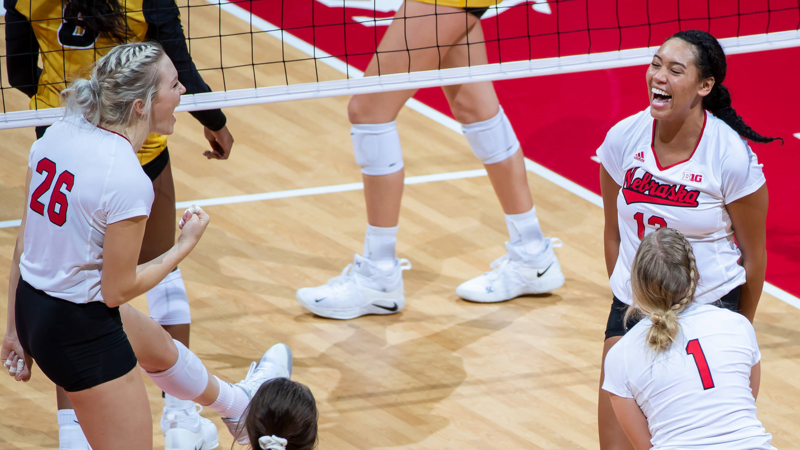 Kills by Sweet, Sun and Foecke kept the Huskers in the lead, and Sweet hammered an overdig before a Missouri hitting error made it 17-13 Huskers. Missouri scored three of four points to get within 18-17, but Foecke recorded another kill and an ace on back-to-back rallies to restore a four-point lead at 21-17. Sun gave Nebraska set point at 24-21 with a pair of kills down the stretch, and Schwarzenbach clinched the 25-22 win with her first kill of the night. Nebraska scored 17 of its 25 points on kills with Foecke and Sun each posting six while hitting .545 and .500, respectively. Set 3: Foecke and Stivrins continued their dominance, combining for three early kills and a block to put the Huskers up 5-2. After a Missouri kill, Nebraska ran off four straight points with kills by Foecke and Hames and a block by Foecke and Stivrins, and the Huskers led 9-3. Foecke and Hames tacked on the Huskers’ sixth and seventh aces of the night to put the Huskers up 14-6. Missouri went on a 4-0 run, which Schwarzenbach ended with a kill. The Huskers led 18-14 before taking control of the match with a 5-1 spurt to go up 23-15. Stivrins, Foecke and Sun combined for kills on four consecutive rallies, and the Huskers closed out their fifth sweep in a row, 25-18. Up Next: The Huskers move on to face 10th-seeded Kentucky in an NCAA Regional Semifinal match next Friday in Minneapolis, Minnesota. No. 2 Minnesota will play 15th-seeded Oregon in the other match. Nebraska won its 10th straight match and fifth in a row by sweep. The Huskers moved to 72-3-1 all-time against Missouri, including 16 straight wins and wins in 60 of the last 61 meetings. Nebraska is now 110-31 all-time in the postseason after winning its eighth straight postseason match. The Huskers are 75-7 all-time at home in the NCAA Tournament, including a 20-2 record at the Devaney Center. Nebraska has won 12 straight home matches and 52 of the last 55. The Huskers will make their 34th NCAA regional appearance in 37 trips to the NCAA Tournament. That is tied with Stanford for the most all-time regional appearances. The Huskers have advanced to a regional in 24 of the last 25 seasons and in 18 of John Cook‘s 19 seasons as head coach. Mikaela Foecke and Kenzie Maloney are 18-1 in their NCAA Tournament careers. Mikaela Foecke had 16 kills in the match on a season-high .667 attack percentage. With her 16 kills, Foecke now ranks fourth in school history with 1,604 kills, as she passed Jordan Larson (1,600) and Nancy Metcalf Meendering (1,603) during the match. Foecke’s 1,604 career kills are the second-most by a Husker in the rally scoring era, trailing only Sarah Pavan’s school-record 2,0008 career kills. With her 16 kills against Missouri, Mikaela Foecke now has 233 kills in her NCAA Tournament career. Foecke passed Cris Hall (219) and Allison Weston (227) during the match to move up to fourth on Nebraska’s postseason career kills list, five shy of Jordan Larson (238) for third place. Mikaela Foecke‘s 16 kills were her most in a home NCAA Tournament match, eclipsing the 13 kills she had in a first-round matchup with New Hampshire in 2016. Foecke also added two services aces to pass Annie Adamczak (130) for eighth on the all-time career aces chart at Nebraska with 131. LINCOLN, Neb. – No. 24 Mizzou Volleyball (24-8) saw its 2018 campaign conclude Saturday evening, as No. 7 Nebraska proved to be too much in a sweep (25-14, 25-22, 25-18) inside the Devaney Center. Despite the Tigers’ offense improving each set, the Cornhuskers were that much better throughout the night. Nebraska hit .333 or higher in each set played, including a match-best .469 hitting mark in set three. Despite the loss Saturday, the Tigers advanced to the second round of the NCAA Tournament in their fifth straight visit to the big dance (2013, ’15-18). Sents enjoyed another strong campaign defensively as the Tigers’ starting libero, finishing with 400-plus digs for the second consecutive season. Munlyn closes her legendary career at Mizzou as the program’s all-time leader in total blocks (634), block assists (516), blocks per set (1.27) and hitting percentage (.388). Additionally, she ranks second all-time in career solo blocks (118). This year, Munlyn’s 143 total blocks (fourth), .394 hitting percentage (fourth), 116 block assists (fifth) and 1.20 blocks per set (10th) all ranked top 10 in the Mizzou individual single-season record book. Deberg’s 59 service aces ranked third all-time in single-season Mizzou history. It stood as the most aces by a Tiger in a single season since 2002. Deberg finished the 2018 campaign with 522 points, the most by a Tiger since 2016 (Melanie Crow – 532).